Garden Wall by Retallack Thompson and Other Architects. In the blinding light of a thirty-three-degree summer day, I watch a black-clad figure exit the National Gallery of Victoria’s (NGV) Great Hall onto the court fronting the garden, cross the misting moat and pass through a portal centrally located in a glimmering white wall. The figure turns right, dissolving into a dark shadow, and then left, eerily transmuting into a ghost and then … gradually fades from view … and is no more. 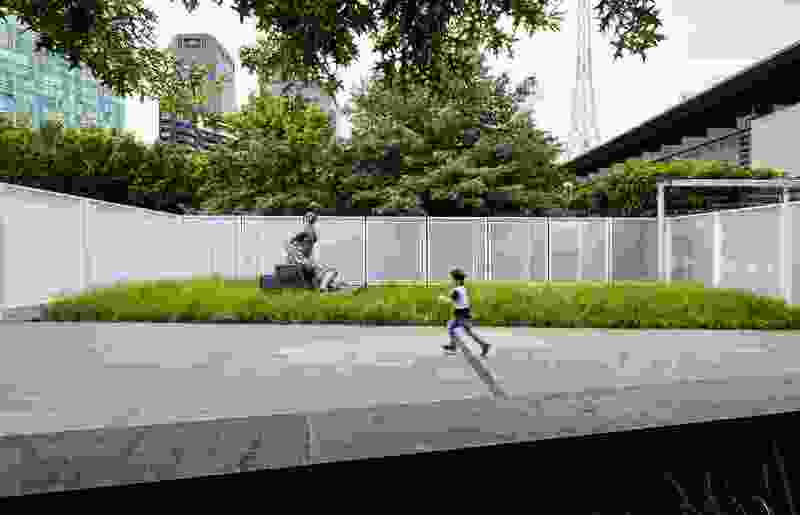 This is Garden Wall, the 2017 NGV Architecture Commission, by friends and collaborators Retallack Thompson and Other Architects, both emerging Sydney-based architectural practices, whose winning entry was selected out of seventy-nine proposals. Garden Wall by Retallack Thompson and Other Architects, featuring Henry Moore’s bronze sculpture Draped Seated Woman (1958). The 2017 NGV Architecture Commission coincides with the inaugural NGV Triennial. 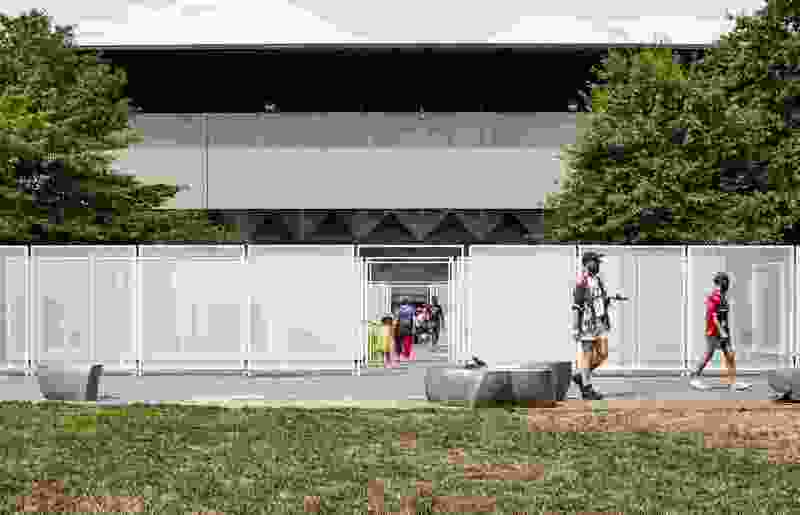 Much has been made of the NGV Triennial’s focus on the political, with its themes of borders and migration, including Candice Breitz’s renaming of her video installation as Wilson Must Go in protest at the involvement in Manus Island of the NGV’s own security contractor, Wilson Security. 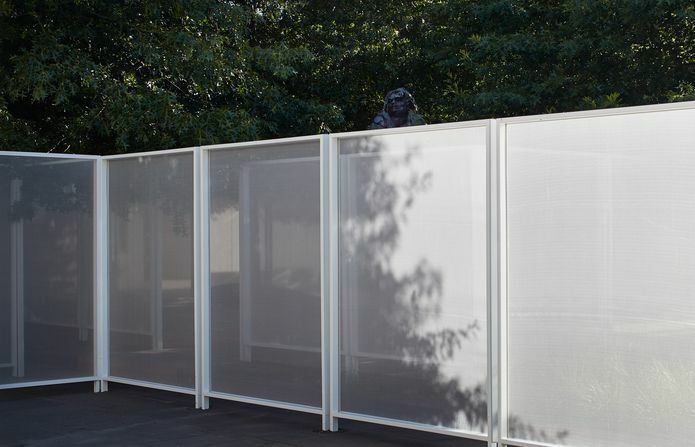 Responding to the Triennial themes, the 2017 NGV Architecture Commission winners claim to provide “an opening for discussing architecture’s political dimensions and the global proliferation of walls, borders and barriers.” But is Garden Wall a political work? From the Great Hall, the installation appears to be an impenetrable barrier intersected by one aperture. 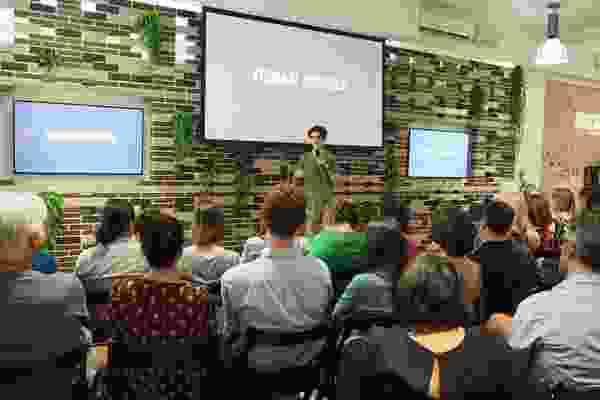 At this point, perhaps, one may ponder the fence as a measure of control to both create territory and limit human movement – what is it keeping in and what is it keeping out? 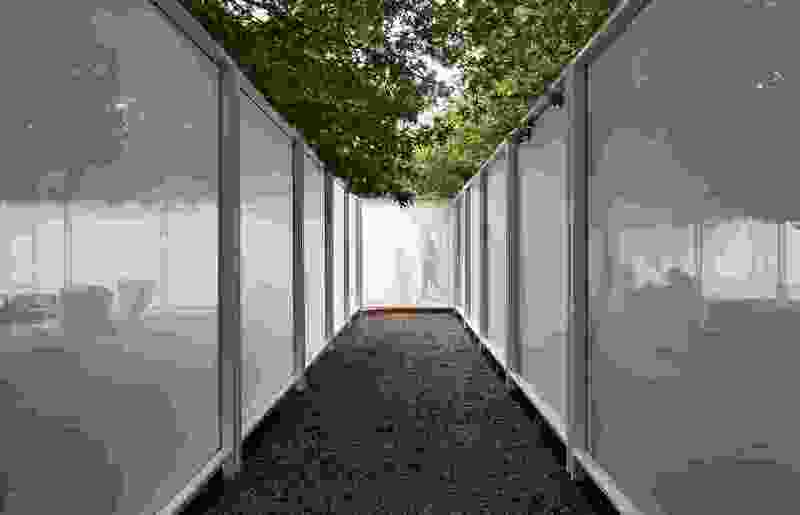 Once inside, however, the experience of inhabiting the spaces that Garden Wall creates is far too delightful for contemplating the horrors inherent in the struggle of refugee statelessness. 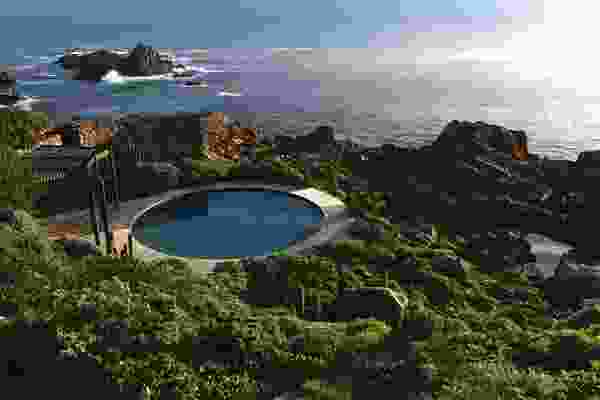 Better instead to focus on how Garden Wall cleverly generates new conditions for using and experiencing the Grollo Equiset Garden. 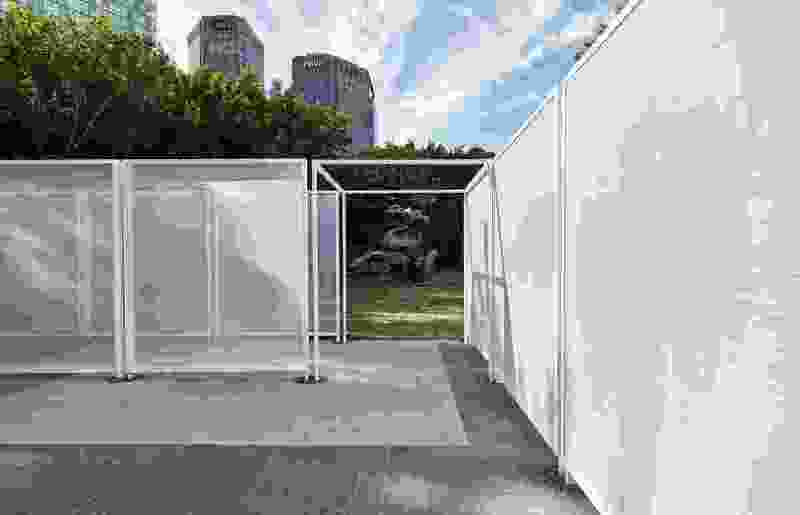 In a world of art-festival programming that can feel inundated with pavilions, it is no coincidence that the 2017 NGV commission is less “building-like” than its two predecessors. 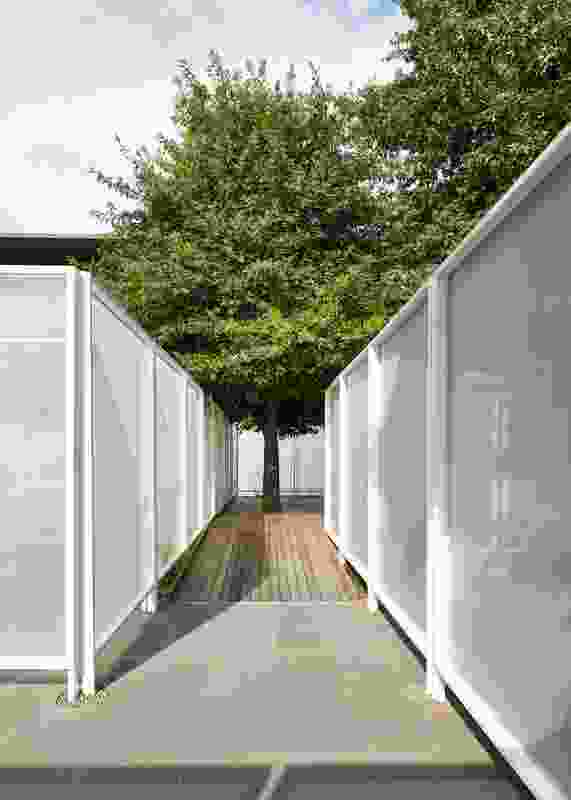 The designers’ ambition was not so much to create a showy new focal point as to employ the simple contrivance of a fence to bring the latent potential of the garden into the foreground. 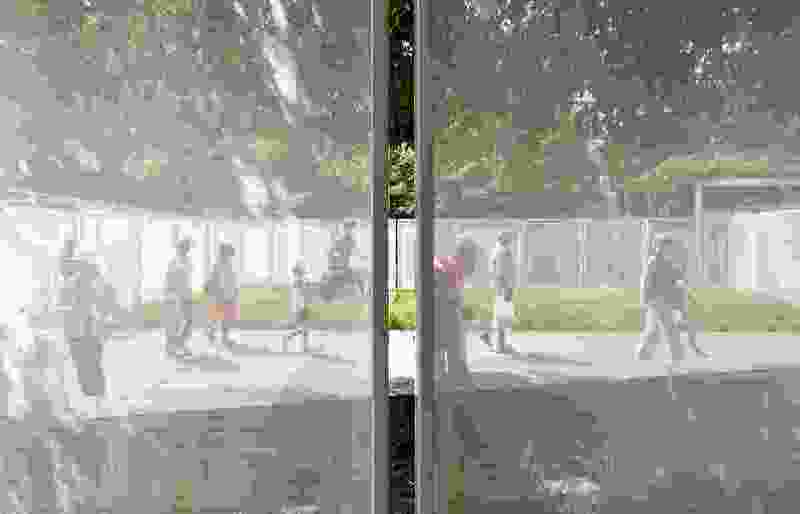 The installation achieves this by drawing on the strategies of site-conditioned art, in particular the work of artist Robert Irwin, whose 9 Spaces 9 Trees adjacent to Seattle’s Public Safety Building (1983, reconceived for the University of Washington in 2007) and Two Running Violet V Forms at the University of California San Diego (1983) are clear antecedents. 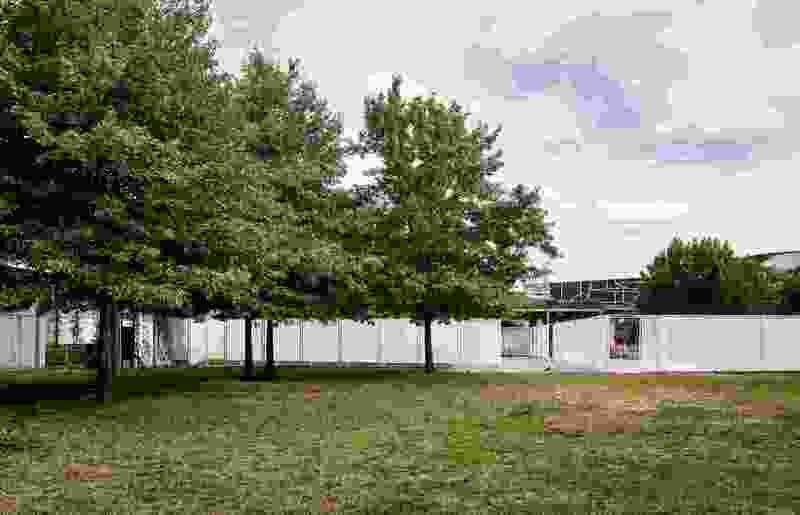 In both these installations the conventional chain-link fence, coated purple, was transformed into a device registering light and shade through a moiré of overlapping mesh planes: in the first case as a labyrinth of nine meeting spaces and in the second as an elevated, zigzagging form set against the slope of the earth and the symmetrical grid of eucalypts through which it weaves. 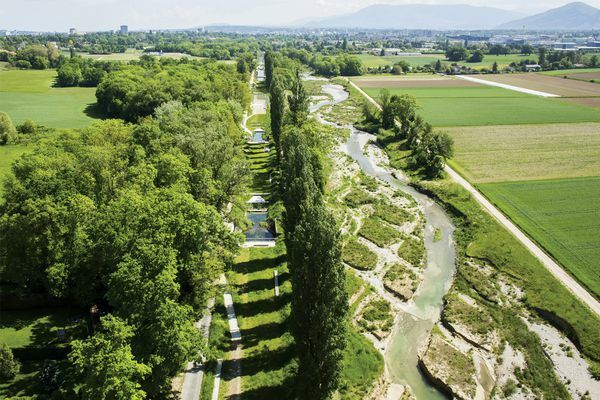 Retallack Thompson and Other Architects have carefully studied the site, taken the fence and traced a revelatory path that establishes a new pictorial, geometrical and spatial order, hiding and then illuminating aspects of the garden and recontextualizing existing features. Garden Wall is a maze of sorts, but its twists and windings are punctuated with a few IKEA Showroom-like short cuts so as not to make the journey too puzzling, prescriptive or dead-ended. Contained within and linked by the passages is a series of beautifully framed views and rooms, in plan not unlike the spatial sequence of the interior workings of the main NGV gallery space, where passageways wrap around the central exhibition spaces and courts. 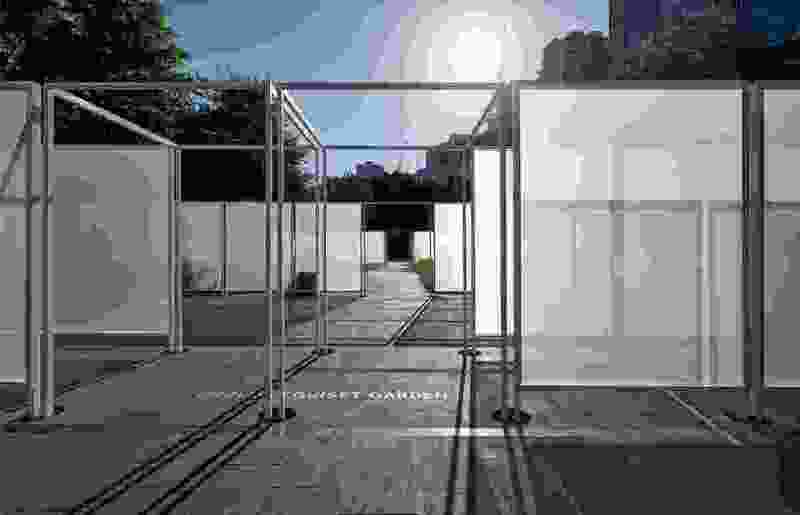 The first room Garden Wall defines is social, capturing the outside bar and the edge of the existing pergola and creating an area for tables and chairs in the sun that is continually populated. Passing through another threshold in the fence, one encounters a new outdoor gallery room, in which Henry Moore’s bronze sculpture Draped Seated Woman (1958) is brought into focus and contained against the backdrop of white and surrounded by tufted grasses. The room also captures an existing seat wall, reorienting it as a viewpoint from which to sit and contemplate the sculpture in profile. 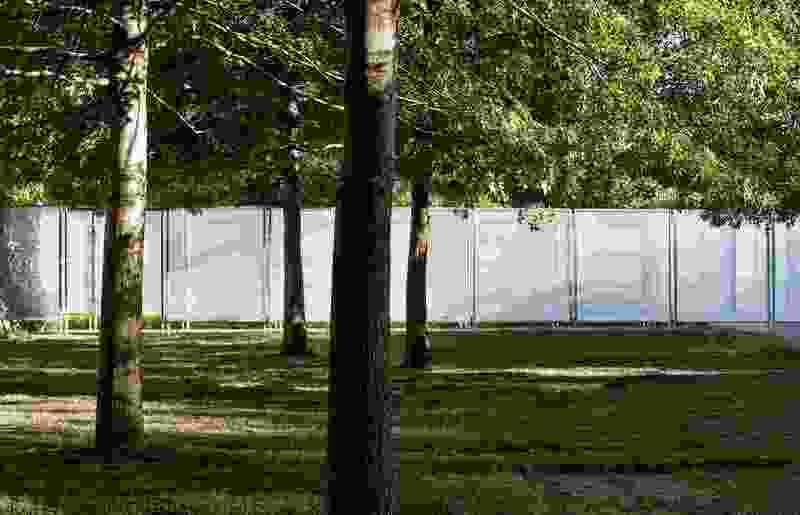 From within the connecting corridors, views open and close and framed compositions appear – a centrally placed tree, the edge of the Willem de Kooning sculpture Standing Figure, a long view across the lawn, a shadow. The most forced embellishment, included as a sensory experience beyond the visual and tactile, is the least successful: a cul-de-sac of the maze filled with eucalyptus foliage over bluestone screenings in which participants were anticipated to walk through the verdure, crushed leaves emitting their distinctive scent. 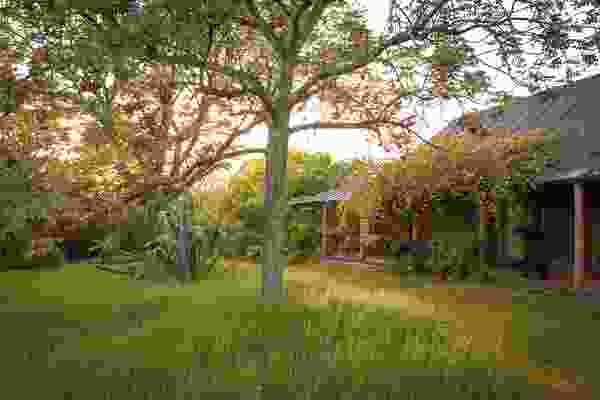 The foliage was fresh and green at opening, but on subsequent visits this space remains empty, the leaves brown and untrampled. Best to head left and discover, deliberately close under the unsettling gaze of Auguste Rodin’s Balzac (1898, cast 1967), an expanse of timber decking under the dense shade of a grove of existing pin oaks. Find a beanbag and settle in. Normally you wouldn’t, as the trees usually form the background behind the aforementioned seat wall and are surrounded by grass with no path leading to them, but the way the site has been reconfigured reinvents this as a desirable place to be. 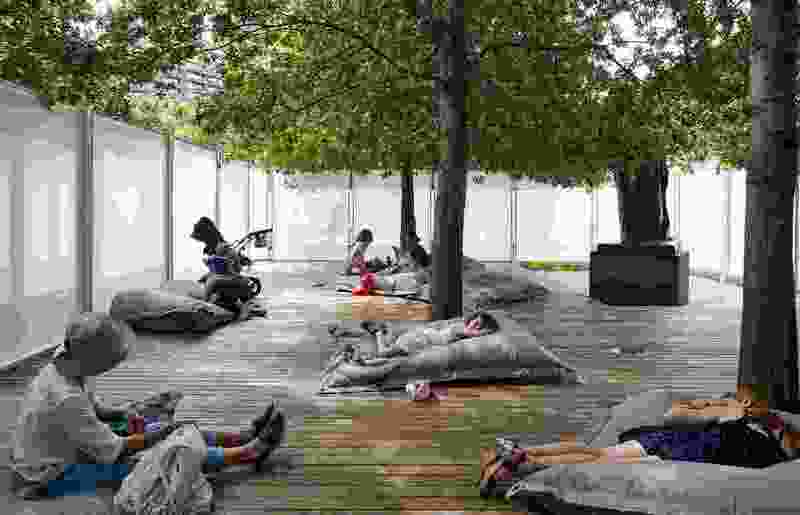 Other Architects was short-listed for the 2016 Architecture Commission with its proposal Sleeping in Public. The architects have managed to roll in some of their previous thinking and this deck could be the best place in Melbourne this summer for a communal, warm afternoon snooze. 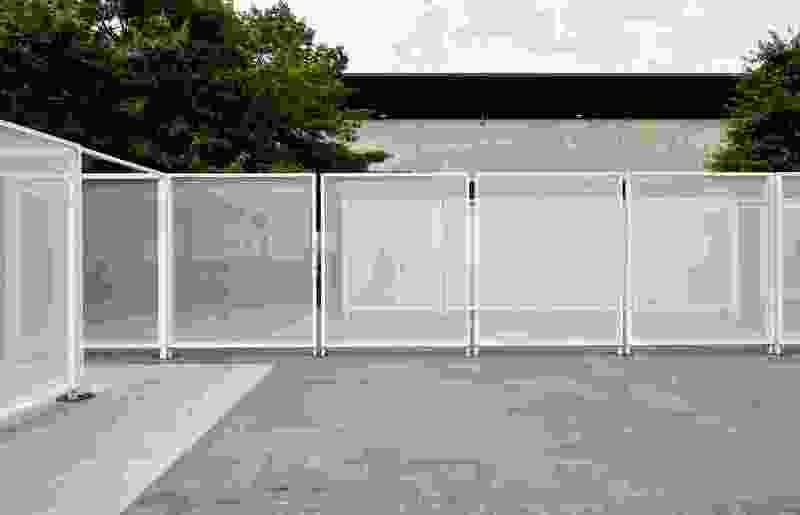 Modular, self-bracing frames lining the passages and rooms are clad in a fine geotextile mesh typically used in greenhouses to prevent the ingress of small insects. The simplicity of the singular repeating element is reinforced by the elegance of the detailing, and the NGV’s commitment to making the commission seem less temporary (despite the reference to temporary fencing) is evidenced by the coring of the existing paving to allow the frames to be seamlessly embedded in the garden fabric. The frames and mesh are as white and pristine as a crisp ironed shirt. The mesh responds to the changing light, drawing attention to the subtleties of perception between reflectivity, translucence and opacity. Views fade in and out. Vertical bands of light catch the mesh and shimmer – they follow you, animated by your motion. Everything looks good in soft focus. In the evening the mesh takes on the golden glow of dusk light. 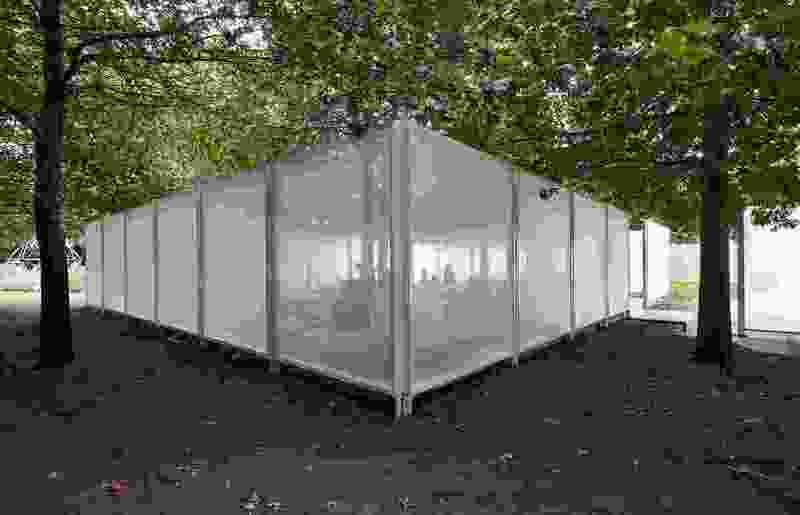 And of course, it is an effective scrim for night-time lighting and projection to support the obligatory evening event programming that accompanies the Triennial. 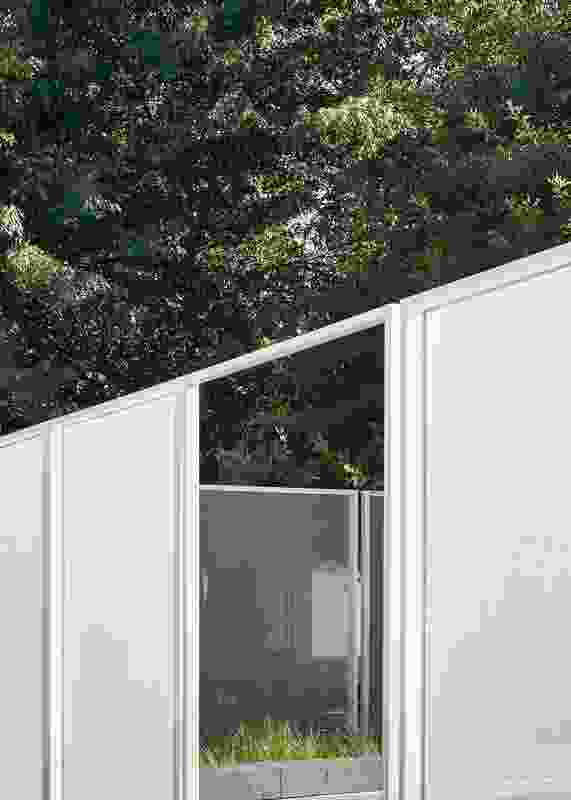 Garden Wall has the lightness and brightness that characterize Retallack Thompson’s minimal and tightly controlled works and the sharp unravelling and repurposing of traditional building and landscape types central to many of Other Architects’ projects. 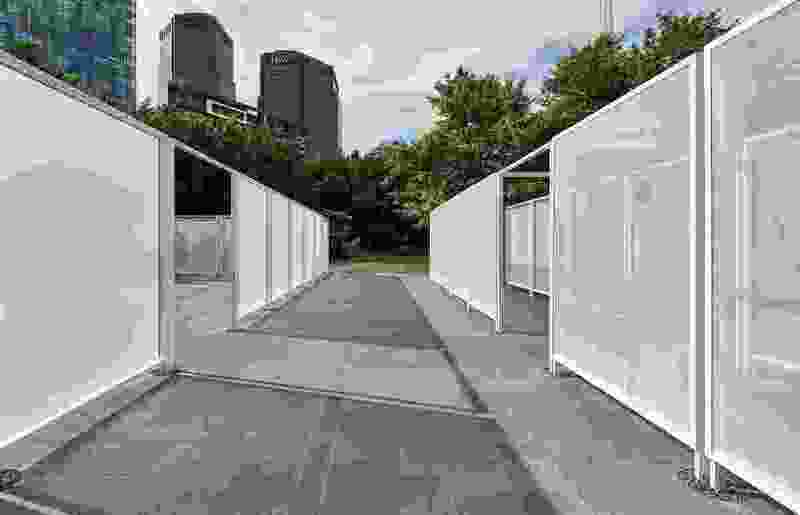 The ability of any individual NGV Architecture Commission to live in the mind long after the doors are closed and the work packed away relies on its capacity to cultivate an individual personality during its tenure. 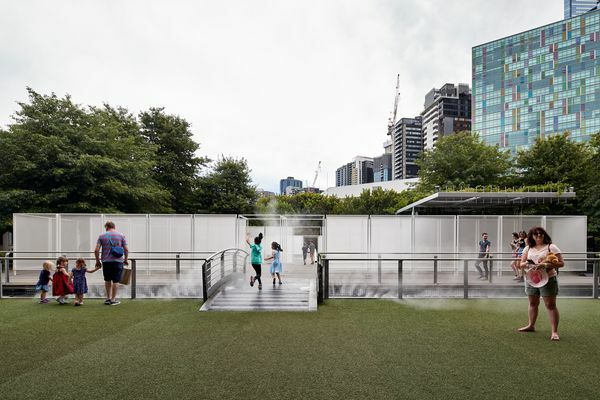 The 2015 John Wardle Architects installation reintroduced the public to the renovated space of the Grollo Equiset Garden, drawing people out of the Great Hall with its flamboyantly coloured canopy placed toward the rear of the garden like a tempting lolly. In 2016’s Haven’t You Always Wanted …? by M@ Studio Architects, the transplantation of suburban tropes created a stage on which the exuberant joy of children and adults alike and the embrace of ironic play were exhibited. 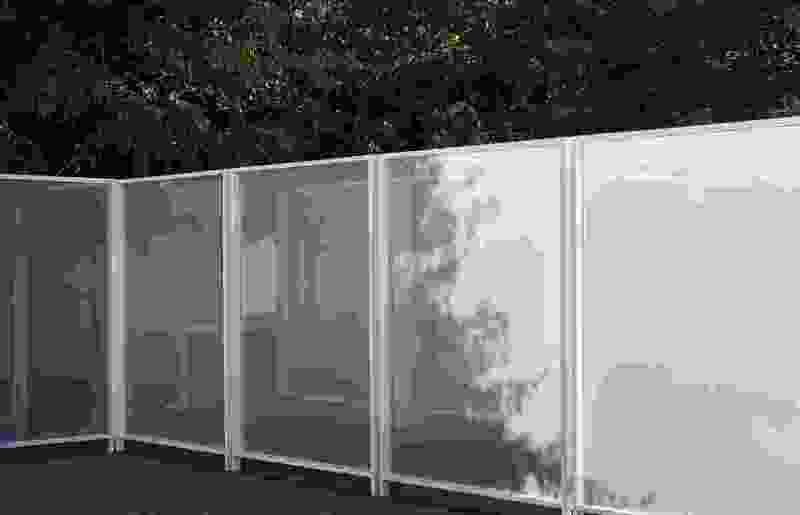 How Garden Wall could make a significant contribution is through its observation and ability to remake aspects of the Grollo Equiset Garden. 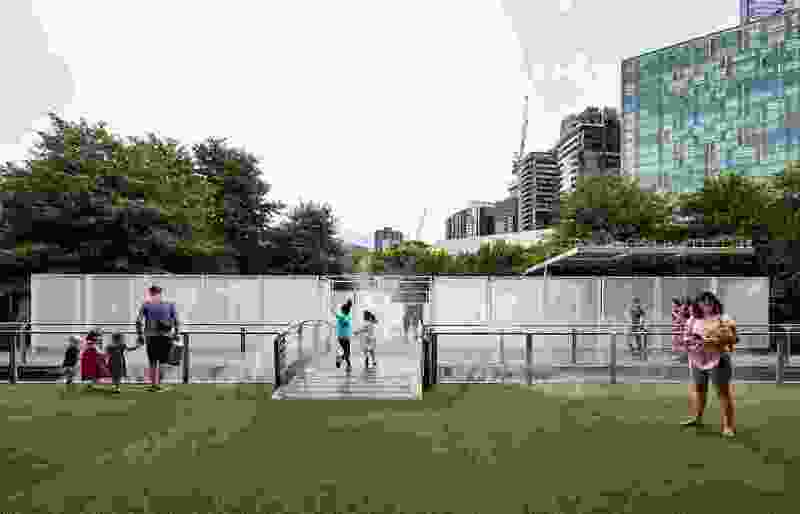 Dear NGV – please take note and keep that deck under the trees. 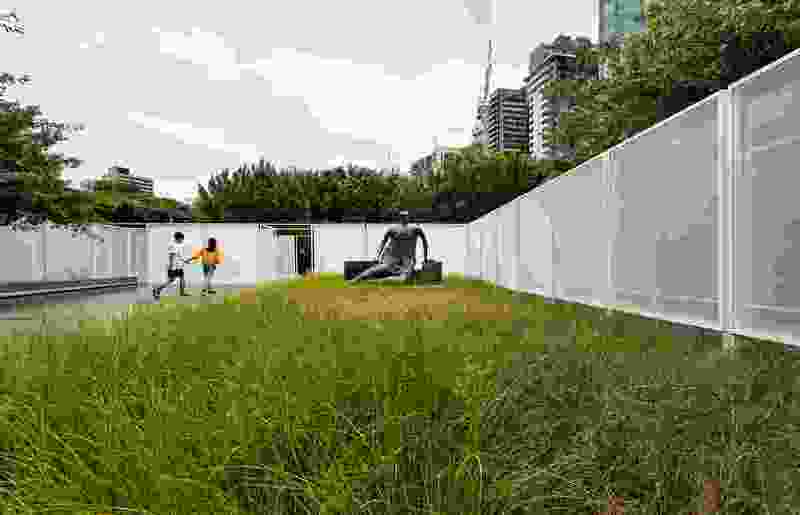 Garden Wall is being exhibited as part of the NGV Triennial until 15 April 2018. 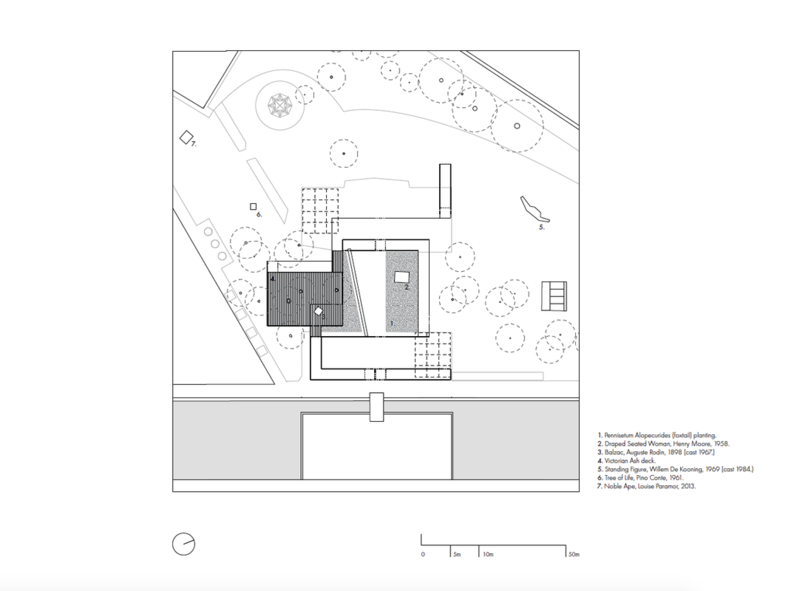 Site plan of Garden Wall by Retallack Thompson and Other Architects. Image: Retallack Thompson and Other Architects.